Three times a day we gather in this church that bears the name Church of Reconciliation. On entering we are all invited to commit ourselves to reconciliation. But what does this word mean? Probably for all of us, the word reconciliation evokes conflicts and divisions that challenge us and that we would like to solve. But we must first take another step. It is welcoming the reconciliation that God offers us. Tomorrow night, like every Friday, we will have the prayer around the cross. Everyone will be able to come up, putting his or her forehead on the icon of the cross and by this gesture laying down all their burdens and even their faults. Christ, even if he remains invisible to us, welcomes us. He did not come for the perfect, but to join us where we are and to walk alongside us on a path that makes us grow in love. He came to forgive and to heal. This reconciliation with God is given to us unconditionally. In us, it can overflow into kindness for others. It broadens our love for others. Let us begin with our loved ones, our families, our communities, in our places of work or study. May our parishes and communities be places of kindness. And we must learn to accept others even when they are different from us. For our community, this is the first requirement: to welcome God’s reconciliation and to live it out among ourselves. 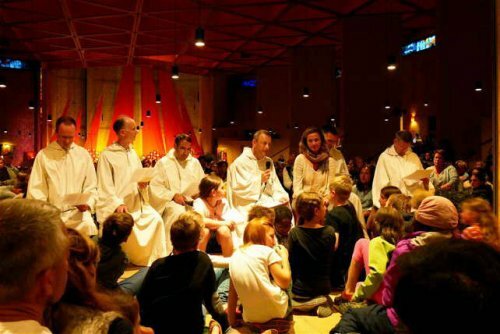 Being brothers of Taizé is not a title; it’s a call. We are committed to becoming brothers for each other day after day. Reconciliation must also be extended to those far away and I would like to say a word about the challenge posed in many countries of the world by migration. The huge wave of refugees sweeping across Europe cannot leave us indifferent. The war in Syria is causing the number of refugees to grow. We pray for peace to come to that country and to the entire region affected by this war. But migration goes beyond this conflict. From Africa thousands of people are coming, and this will not stop. So many refugees have drowned in the Mediterranean. Christ’s reconciliation urges us to welcome those who come. Of course, at the same time there should be policies that enable people to stay in their countries with the prospect of a decent future. This evening I want to make a simple proposal. Let each one of us make a personal contact with refugees. Many are already doing this. Let us spend time with them, listening to their stories. They come from a different world than ours; they have a different mentality and lifestyle. This can destabilize and even scare us. This is why personal meetings are indispensable. At Taizé we have offered hospitality to a number of refugees. If this requires a lot of us, we receive more than we give. They open our eyes to their countries of origin; we feel their pain of having left everything. In our region solidarity is growing. Many people we did not know before come to help us welcome them. Among these refugees there are Muslims and we are deepening our knowledge of their religion. A friendship with them requires us not to confuse an inhuman Islamist ideology and the faith of so many Muslims who want peace. Many of you are taking concrete steps in this perspective. There are groups that come here bringing refugees with them. These days, several workshops are devoted to the issue. Those taking part in the group on solidarity are also deepening this topic. This week Amaya, who works for the Jesuit Refugee Service, is with us. I asked her what can encourage us to open ourselves more to the challenge of migration. She will talk to us before the children distribute flowers to every nation represented here. Amaya: I would like to share with you the words of a refugee friend from Kenya, Antony who, after a long journey through Africa, experienced welcome and solidarity by a community in Italy. “Displaced persons have many needs such as housing, food or education. However, in my experience as a refugee, what refugees need most is love and compassion, which enables them to restore the dignity that has been taken away from them by conflict and sudden displacement. There are flowers for those from Korea, China, Hong Kong, Macau, Philippines, Indonesia, Vietnam, India, Lebanon, Iraq, Palestine, and for those from Syria, especially Moussa. For those from Australia, New Zealand, USA and Canada. For those from Russia, Estonia, Latvia, Norway, Finland, Sweden and Denmark. For those from Lithuania, Poland, Germany, Netherlands, Belgium and Britain. For those from Ukraine, Hungary, Czech Republic, Slovakia, Austria, Switzerland and France. For those from Romania, Serbia, Bulgaria, Slovenia, Italy, Spain and Portugal. For those from Uganda, Kenya, Chad, Burkina Faso, Benin, Togo, Senegal, Algeria and Egypt. For those from Argentina, Chile, Bolivia, Brazil, Colombia, Costa Rica, Guatemala, Dominican Republic, El Salvador, Honduras, Puerto Rico and Mexico. Brother Alois: A final word. Tomorrow night I will be away, for not far from here in Paray le Monial, there is a meeting dedicated to the discovery of Judaism, and I would like to join them to attend the celebration of the Sabbath.